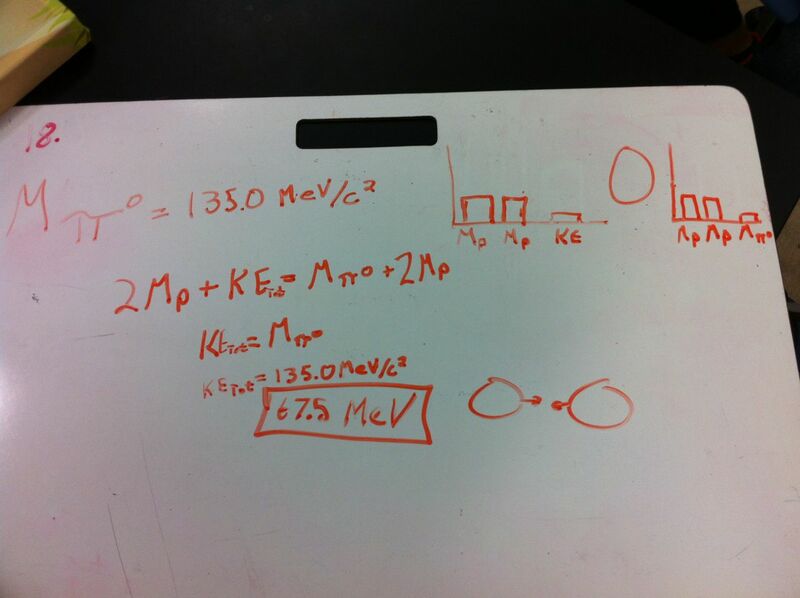 I love how some of my students continue to apply energy LOL diagrams long after we have finished the “energy” unit. In AP Physic B, we are in the midsts of an abbreviated particle physics unit. This group drew the LOL diagram for the collision of two high-energy protons creating a pion. The units for energy have changed to MeV, but the diagrammatic representation has not. In AP Physics B, we are in the middle of an abbreviated particle physics unit. Since we are so close to Fermilab, I feel compelled to introduce students to the history of particle physics and the organization of the Standard Model. Fermilab has a number of fantastic activities that are prelabs for the Particle Physics Masterclass. Today, we used data from the D-Zero detector to calculate the mass of the top quark. It is fantastic to use data from D-Zero and to walk through the identification and calculations involved in a collision event. 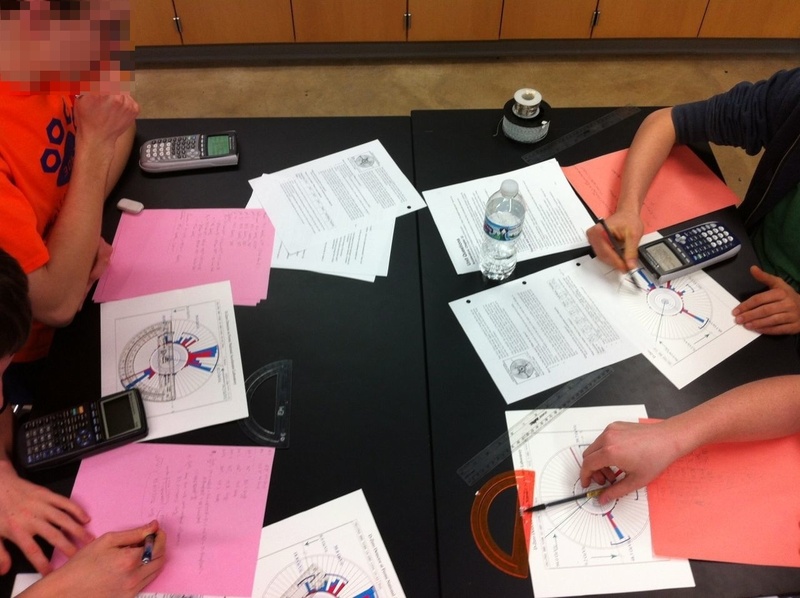 It is also a great way to “trick” students into reviewing and practicing 2D conservation of momentum problems in preparation for the AP exam! The results were fantastic. The average of two classes of data was within 1 GeV of the mass of the top quark. 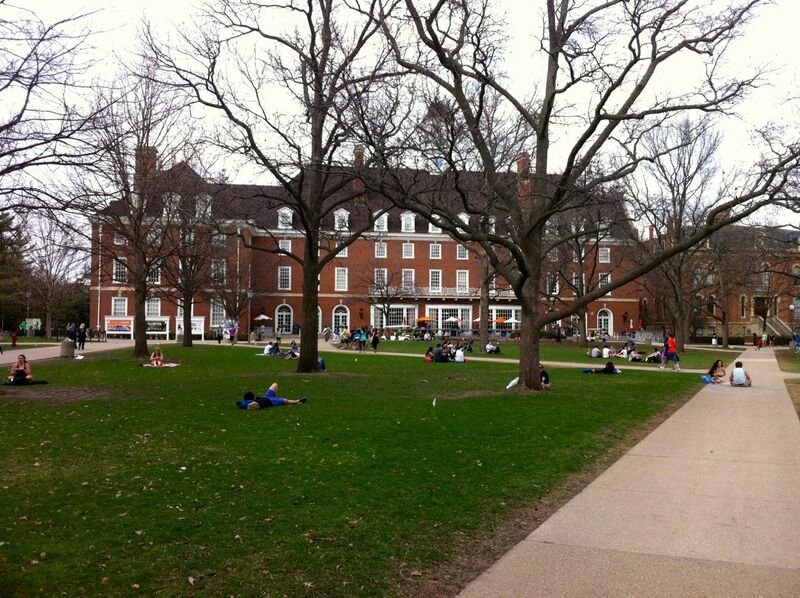 Today and Saturday, the team and I are on the campus of the University of Illinois for the State Science Olympiad competition. The students will compete in a huge variety of science and engineering events. I’ll help run one of them. The weather is fantastic and it looks to be a great weekend. Today, we started the circuits unit in Honors Physics. We always start with the batteries and bulbs activity from the Minds of our Own video. 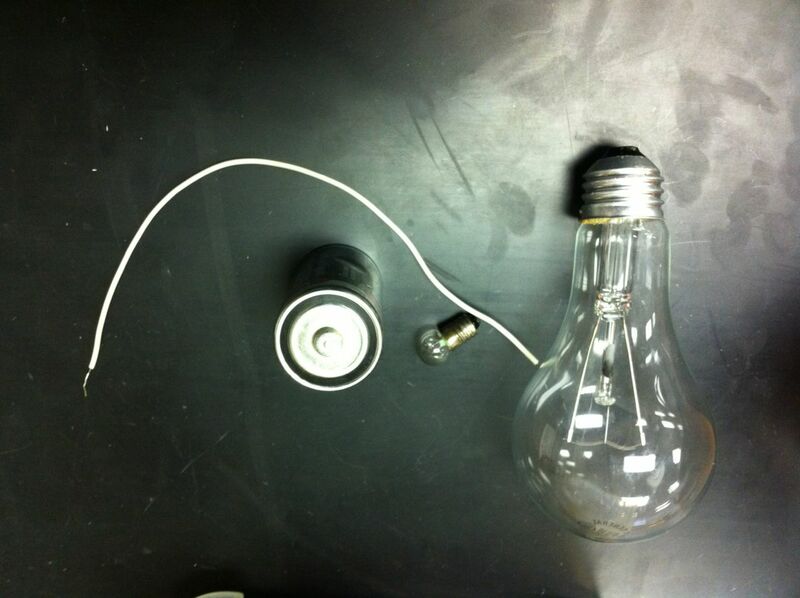 In this activity, students are given a battery, light bulb, a piece of wire and instructed to light the bulb. Many students struggle to do this. I give everyone enough time to figure it out and to draw a diagram of four ways to accomplish the task as well as diagrams that are ineffective. We then watch the video and I congratulate them on bettering the Harvard and MIT graduates. I’m really looking forward to this new circuits unit. My colleague who designed the unit has done an excellent job combining elements of the McDermott’s Physics by Inquiry materials and the CASTLE curriculum. In addition to the battery and bulb activity, students made detailed and thorough observations of an incandescent lightbulb to determine how it works and why it is constructed the way it is. In past years, I’ve broken the glass bulb to make it easier for students to see the inner elements. This year, my colleague purchased 150 W bulbs with extremely clear glass. Students can observe the inner workings with the glass intact which makes handling and storing the bulbs so much easier. 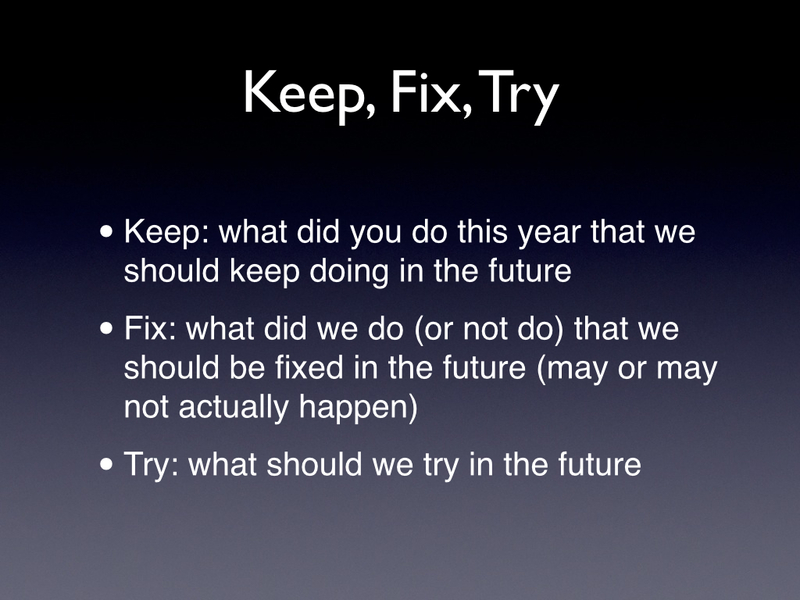 A reflection technique that I learned from Scouting, is “Keep, Fix, Try.” Each year, we use this technique to reflect on the FIRST Robotics season. The students demonstrate remarkable insight. In the past, their feedback has resulted in significant changes the next year that has elevated our team to where it is today. In consideration for the introverts among us, I always encourage students to submit their reflections offline and privately as well. I have received seven pages of reflection from graduating seniors in past years. 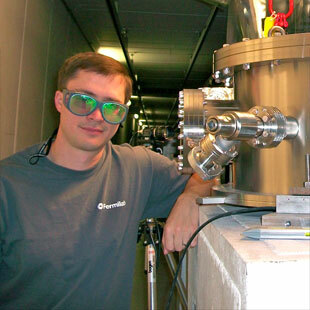 A few summers ago, I had the pleasure of working at Fermilab on the Holometer Experiment. I wrote a series of posts attempting to explain the experiment. In my AP Physics B class, we take a day after finishing nuclear physics to share my experience with my students. The Holometer and the physics behind it are a great example of how much we don’t yet understand about our universe. I want students to appreciate that the field of physics is constantly changing and there is so much more to explore. Too often an introductory physics course presents the material in the context of 100-year-old, dead, white guys. This past weekend, Huskie Robotics, FIRST Team 3061, competed at the Midwest Regional Competition. I am so proud of how the team performed. After qualification matches, we were ranked 7th, perhaps our highest ranking ever. During alliance selection, we became the captain of the fifth-seeded alliance where we selected teams 111 and 1781. Our alliance was defeated in the quarterfinal which was a disappointing end to our season. However, the extraordinary efforts of several of our team members was recognized when we were awarded the Gracious Professionalism award for the assistance our team provided to other teams. This is the second time in three years that we have been awarded the Gracious Professionalism award. One of our team members spent considerable time assisting a rookie team. This rookie team was selected as the third robot on the first seeded alliance which won the regional. To show their appreciation, this team gave one of their championship medals to this student! This students efforts on the competition is illustrative of the culture we have tried to build over the years on our team, which makes me so proud. Furthermore, our mechanical lead Arpan was named as one of the Dean’s List finalists and will go to St. Louis to compete against other Dean’s List Finalists. Arapn has contributed so much to the team and FIRST over the past four years and this award is well deserved. Midwest Regional Day #1 from Naperville North High School on Vimeo. Midwest Regional Day #2 from Naperville North High School on Vimeo. Midwest Regional Day 3 from Naperville North High School on Vimeo.